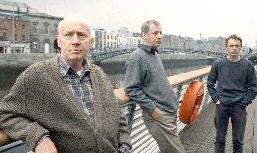 Like This Lime Tree Bower Conor McPherson bases his new play Port Authority round three monologues. Here are three men, three different generations voicing their experience about missed opportunities, relationships that never made it and risks that were never taken. They exemplify McPherson's special low key ability for Irish tale telling, with the men allowed to be centre stage talking about their feelings. The stage is bare except for a bench and McPherson, who also directs, has each man talks alone so that at first we have no connections to make. A bell sounds the space between each man's speech. As one divulges, the other two sit passively in near darkness. The connections, when they are made, are tenuous so that what holds these monologues together is a personal response rather than that necessarily proscribed by the playwright. Kevin (Eanna MacLiam) is the youngest man. Having just left home his problems are to do with housing and sexuality as he feels his way in the world. The out of control housewarming party which has the whole youth population of Dublin invited, is a blast. Dermot (Stephen Brennan), the middle aged man, is a loser. He is head hunted, by mistake, for a job in which he is out of his depth. He is abusing alcohol in an attempt to blank out the hurt in his life. The graphic picture he draws of hangovers and alcoholic haze are accurate and painful as in this metaphor for one monumental hangover: "The sun was beginning to shriek in through the window." Joe (Jim Norton) is the third man. He is an old man, an active widower who lives in residential care, his white haired days full of regret for opportunities passed over. The performances are seasoned and expert. Each man's articulation of loss and the perceived turning points is moving. The concentrated ninety minutes intersperses sadness with moments of wry humour. This is in the same vein as McPherson's other plays -- no moments of high drama, only a wistful, elegiac sense that there is more to Ireland than bonhomie and joking.